I applied for a grant with the Catholic Communication Campaign on March 1, 2009, to make a documentary about evolution and religion. My grant application was denied in a way that indicated my application was not even considered, notwithstanding the public request for proposals and the implied promise that my proposal would be read. I complained to Archbishop George Niederauer in the two enclosed letters and got the response dated June 30. I contacted the communications directors of Brooklyn, New York, and Philadelphia dioceses, as the letter from the Archdiocese of San Francisco suggested, but to no avail. I want an apology from the CCC or some kind of assurance that the CCC is being properly supervised. May 27, June 27, and June 30 letters enclosed. I think you should know about my correspondence with Fr. Stephen M. Fields of Georgetown University. I wrote to him on September 19, 2012, with the admonition that he resign from the Academy of Catholic Theology to protest the behavior of Dr. Stephen Barr, a fellow member. Fr. Fields pretty much gave me a runaround. Catholic Truth of Scotland published an article I wrote explaining why the American Journal of Physics should retract “Entropy and evolution” (Am. J. Phys, Vol. 76, No. 11, Nov. 2008). The article contains an incorrect equation for entropy that makes the article worthless. Entropy is a variable in thermodynamics and statistical mechanics, and the article promotes atheism by ridiculing creationism and disseminating misinformation about evolutionary biology. Dr. Barr writes about evolution for First Things and is an advisor to this journal. He is a physicist and certainly should understand why the AJP article is absurd. Nevertheless, he said that I was wrong and that my views of evolutionary biology were harming the Catholic Church. In effect, Dr. Barr, First Things, and Fr. Fields are helping the American Journal of Physics cover up their mistake in publishing the article. They are also guilty of disseminating misinformation about evolutionary biology for as long as the article is in a peer-reviewed journal. I’v asked Nicano Austiraco, Gary Culpepper, Paul Gondreau, James Keating, Sandra Keating, and Tomas Petri to resign from the Academy of Catholic Theology to protest the actions of fellow members Stephen Barr, who writes about evolutionary biology on the pages of First Things, and Russell Reno, who is the editor. Russell and Barr are helping the American Journal of Physics and the American Association of Physics Teachers cover up the mistake of publishing an absurd article (Daniel F. Styer, “Entropy and evolution,” Am. J. Phys., Vol. 76, No. 11, November 2008). I explain why the article should be retracted in an essay published by the newsletter of the Catholic Truth of Scotland (http://www.catholictruthscotland.com/MAYnewsletter12.pdf). In an email to me, Stephen Barr said the AJP article was okay and that I was harming the Catholic Church. This is like mathematicians arguing about whether 2 +2 = 4 because the AJP article is based on an erroneous equation in physics and we both have PhDs in physics. Also, you don’t need to be a physicist to see why the article is anti-creationist propaganda with no scientific value. This is why I expect the above faculty members of Providence College to respond to my request in a more reasonable way than they have. I asked Russell Reno for a personal interview so that I could explain why Barr and the editor and publisher of the American Journal of Physics are violating accepted procedures for peer-reviewed journals. Reno’s negative response to my request for an interview is similar to the response of many members of the Academy of Catholic Theology. The behavior of mobs is part of the history of the 19th and 20th centuries. The Academy of Catholic Theology has become a mob that lies about science, not the kind that breaks glass windows. I am writing to complain about the 10 Jesuits who are members of the Academy of Catholic Theology (http://www.academyofcatholictheology.org/) and four Provincials. One such Provincial is Father Provincial David S. Ciancimino of New York who refused my request for a personal interview. I’v asked the 10 Jesuits to resign from the Academy of Catholic Theology to protest the conduct of three other members: Stephen M. Barr, R. R. Reno, and Robert Louis Wilken who are affiliated with the journal First Things. My complaint against First Things is that it is refusing to republish my letter in the Catholic Truth of Scotland (http://www.catholictruthscotland.com/MAYnewsletter12.pdf). Dr. Barr, who received the Benemerenti medal from Pope Benedict, said I was mistaken about evolution and was harming the Catholic Church. First Things is helping the American Journal of Physics and its publishers (American Association of Physics Teachers and the American Institute of Physics) cover up its mistake. The phenomena of the Big Bang, the origin of life, and evolution are reasons to believe in the Bible because the Bible says God created the universe from nothing for the sake of mankind. For a peer-reviewed journal to disseminate misinformation about evolution is outrageous. My YouTube video titled "The Truth About Evolution and Religion" (http://www.youtube.com/watch?v=qKaF8vX6HXQ) also sheds light on this issue.This is a link to my submission to First Things: http://newevangelist.me/evolution-and-the-culture-war/. http://www.brownpapertickets.com/event/316545">Reservation for "Pseudoscience in the American Journal of Physics"
I am writing to ask you to reconsider your decision not to meet with me so that I can explain why “Entropy and evolution,” (Am. J. Phys., Vol. 76, No. 11, Nov. 2008) should be retracted and why your behaviors are damaging the reputations of Catholic priests. The newsletter of the Catholic Truth of Scotland published my explanation of why the article is absurd to rebut atheistic propaganda. Stephen Barr, a member of the Academy of Catholic Theology and a Benemerenti Medal winner, said I was mistaken and that I was “harming the Catholic Church.” I accused him of not reading my analysis and demanded an apology. He ignored my emails and faxes. Nor did he advise the Catholic Truth of Scotland that I was mistaken. I might add that no one has answered the analysis at http://creationwiki.org/Pseudoscience_in_the_American_Journal_of_Physics. I am accusing Dr. Barr of lying about our salvation history. The AJP article also undermines the integrity of science and is a matter of national concern. I am communicating with Congressman Yvette Clarke’s office. A member of her staff named Scott initially told me that he could not be my advocate based on the information I initially gave him. I then gave him a 10-page document with 9 exhibits, and he told me the matter was being considered. Fr. Smolich’s remark that Scott was giving me a runaround is without basis, so far as I know. If my accusation against Dr. Barr and his Jesuit enablers is not resolved, I will file a complaint with Cardinal Dolan against Fr. Joseph Koterski and Fr. Joseph Lienhart because of their connection with Barr through the Academy of Catholic Theology, and Fr. Ciancimino and Fr. Joseph McShane. I am filing a complaint against Fr. Thomas Smolich, President of the Jesuits Conference in the United States, for refusing to meet with me to discuss what I hope will be a sign that God has communicated Himself to mankind: The American Journal of Physics retracts an article about biological evolution published in 2008. In my opinion, creationists and advocates of the theory of intelligent design are not good witnesses to faith in God because they promote scientific theories not supported by evidence. They make humanists and atheists look like paragons of reason. This peer-reviewed AJP article does the exact opposite. It makes creationists look like paragons of reason, and mainstream scientists look like lunatics. It proves there is something rotten in the scientific culture of the United States. Richard Dawkins repeated the atheistic propaganda in this article, and the Catholic Truth of Scotland published my rebuttal in May 2012. First Things, America Magazine, Perspectives on Science and Christian Faith, and Zygon: the Journal of Religion and Science are refusing to expose this scandal. I blame a prominent Catholic physicist, Dr. Stephen Barr, for this because he has explicitly stated that I am wrong and am “harming the Catholic Church.” Because so many Jesuits are affiliated with Dr. Barr though their membership in the Academy of Catholic Theology, I think Fr. Smolich has a duty to determine which of us is harming the Catholic Church. I describe Dr. Barr’s conduct in a letter to the President of New York University. Thank you for your letter of June 7, 2013. I sent the enclosed letter to the Superior General of the Society of Jesus by registered mail (RE862697742US). The pastor I referred to in the letter is Monsignor Paddack. The theory of evolution is that a microscopic organism evolved into whales in about one hundred million decades. A decade is the illuminating unit of time, rather than years, seconds, or centuries, because it takes two decades for a fertilized human egg to produce all of the cells in a human body. The only explanation for this theory or fact is the theory of intelligent design (ID), for which there is no evidence. ID advocates perpetrate a scam by comparing ID with natural selection. Atheists go along with the scam because they don’t want to admit that ID is a better theory than natural selection, in some sense. Anther version of this hoax is the stupid and ignorant idea that evolution violates the second law of thermodynamics, which states that heat flows from high temperatures to low temperatures. This hoax sheds light on the murder of civilians by Germans during WWII. No one was ever forced to commit murder. However, there were severe penalties for telling about the murders. Collaboration took the form of keeping silent. Acting upon the advise of my pastor, I recently filed a complaint against the President of the Jesuit Conference of the United States (Thomas Smolich) with Cardinal Timothy Dolan for refusing to see me about a matter that compromises the integrity of Catholic priests who are part of the scientific culture of the United States because of their roll as teachers and editors. These priests are showing more devotion and loyalty to this atheistic culture than to the Catholic Church. Cardinal Dolan advised me in a letter that he has no jurisdiction over Fr. Smolich even though he is president of the United States Association of Catholic Bishops. Fr. Smolich and other Jesuits are putting me in the position of calling Catholic priests liars and moral cowards over an absurd article published by the American Journal of Physics about evolution and thermodynamics. This link (http://newevangelist.me/zygon/) is to an article I wrote about this shocking scandal. I told Fr. Smolich’s assistant about Cardinal Dolan’s refusal to get involved today. Hopefully, Fr. Smolich will screw up his courage and deal with this situation in a responsible manner. If not, I would like to send the Superior General the same information I gave Cardinal Dolan. But are they [advocates of ID] right in saying that the Darwinian mechanism is inadequate to explain biological complexity? Most biologists, including most of those who are devout Christian believers, doubt it very strongly. And even if the ID people are right, it will be virtually impossible to prove that they are right because they are asserting a negative. They are saying that no Darwinian explanation of certain complex structures will ever be forthcoming. Well, there may not exist such an explanation now, but there might exist one later. So, in practice, I don't see a slam-dunk proof for miraculous intervention in evolution as coming out of this movement. The “Darwinian mechanism” only explains the adaptation of species to the environment. The scientific culture in the U. S. hates advocates of ID and creationists. It is truly a culture war. If the AJP retracts an article about evolution that explicitly criticizes a creationist, it will be victory for religion. Fr. Smolich and Fr. Ciancimino don’t want to meet with me for the same reason Cora Marrett, director of the National Science Foundation, doesn’t want to meet with me. After such a meeting, they will have to take either my side or the side of the AJP. If they take my side, they will anger the scientific establishment. If they side with the AJP, they will become collaborators in pseudoscience about evolution. I am complaining about a number of Jesuits to the Superior General and Timothy Cardinal Dolan for taking the side of atheists in the culture war about evolutionary biology. Cardinal Dolan’s response to my letter is at http://newevangelist.me/2013/06/21/priests/. Temperatures are measured with a thermometer (zeroth). Heat flows from hot to cold (second). Minus 270 degrees on the Celsius scale is as cold as it gets (third). Glenn Branch of the National Center for Science Education squelched me by citing an article (“Entropy and evolution,” Am. J. Phys., Vol. 76, No. 11, November 2008) disseminating the same mistaken ideas as Dawkins backed up with an erroneous calculation and the authority of a peer-reviewed science journal. I was amazed at the stupidity of the article and emailed a protest to the editor. Instead of forwarding my criticism to the author, the editor suggested I submit an article of rebuttal. I graduated from New York University in 1971 with a Ph.D. in physics, and contacted a professor at NYU with expertise in thermodynamics. He confirmed that the calculation in the American Journal of Physics article was wrong, but declined to help me when he realized that I was trying to get the article retracted. His last email to me was hostile and insulting. In the meantime, the newsletter of the Catholic Truth of Scotland published my refutation of the AJP article. In the hope of getting support, I contacted Stephen M. Barr, who writes about science and religion for First Things. Dr. Barr is a member of the Catholic Academy of Theology, a fellow of the American Physical Society, and a recipient of the Benemerenti Medal by Pope Benedict XVI in 2007. Dr. Barr told me that I was wrong and was “harming the Catholic Church.” Nothing in his email attempted to defend or explicate the absurd calculation. I contacted the 10 Jesuits who are members of the Academy of Catholic Theology, and asked them to expel Dr. Barr for helping the AJP to cover up its mistake. They all are ignoring my entreaties even though I complained to their Provincials (James Shae, David Ciancimino, J. Daniel Daley, Timothy Kesicki) and the president of the Jesuit Conference in the United States (Thomas Smolich). The unnecessary adverbial phrase “Considered thermodynamically” encapsulates the error of creationists and advocates of intelligent design who think evolution violates the second law of thermodynamics and anti-religion advocates who think evolution does not. Bertalanffy doesn’t understand there are different meanings of the word order and the phrase random events. A gas consists of many molecules, and a protein is composed of hundreds of amino acids bonded together. This famous biologist thinks there is something to be learned by comparing a gas and a protein. Each amino acid has to be in exactly the right place for a protein to work in a living organism. Bertalanffy presumably thinks we know the location of amino acids in a protein, but we don’t know the location of molecules in a gas. The exact opposite is true. All we know about the location of amino acids is which amino acid is next to which. We don’t know the location of the amino acids in x, y, and z coordinates. On the other hand, we know the x, y, and z coordinates of all of the molecules in the gas because we know where the container that holds the gas is located. Because of this confusion, Bertalanffy thinks a protein has more “order” than a gas. Concerning “random events,” Bertalanffy can’t distinguish between improbable events and probability calculations. Biologists calculate the probability of getting the primary structure of a protein by the random selection of amino acids. Physicists can calculate the probability that oxygen molecules in a room will randomly drift out the windows and doors leaving the room short of oxygen. An oxygen-deprived room is an improbable event. The calculation by biologists is just a probability calculation. A number of Jesuits in the United States are helping the American Journal of Physics cover up its mistake in publishing an article about evolution and creationism in 2008. I currently reside in the parish of the Church of Notre Dame in Manhattan. I discussed the matter with my pastor before filing the enclosed complaint against Fr. Smolich with Cardinal Dolan. Cardinal Dolan said that he does not have jurisdiction, so I am telling you about my low opinion of the character of many Jesuits. A version of my article published by the newsletter of the Catholic Truth of Scotland (“Evolution and the Culture War”) and a manuscript (“Exploring the Conflict Between Science and Religion”) are also enclosed. I am broadcasting the enclosed “Open Letter to Jesuits,” and sent it to all of the Jesuits I have previously contacted. Since the integrity of science is a matter of national concern, I filed a complaint with my congressman, Yvette Clarke. A member of her staff (Scott) assured me that my accusation of pseudoscience is being investigated after receiving the enclosed letter and Thirteen Quotes About Evolution. Concerning my enclosed letter to Fr. McShane, Fr. Koterski told me over the phone that it would be inappropriate for him to question Dr. Barr about his knowledge of physics. Fr. McShane ignored my written and oral request for an appointment. Concerning my enclosed letter to Fr. Daoust, I am accusing Fr. Ciancimino of not accepting my invitation to the lecture because he would be obliged to tell Fr. Koterski and Fr. Lienhard that he was taking seriously my accusation against them and Dr. Barr. I try to explain in my enclosed letter to Fr. Sheeran the reason nobody wants to hear what I have to say in person. I have not yet gotten a response to the registered letter (RE862697742US) dated July 16, 2013, I sent Fr. Adolfo Nicolás Pachón after you said you had no jurisdiction over the Jesuits I am criticizing for helping the American Journal of Physics cover up the mistake of publishing article about evolution that promotes atheism. 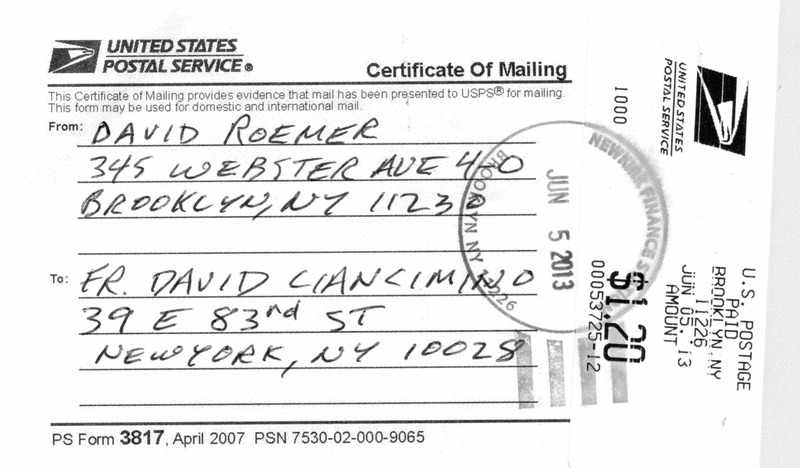 I’v enclosed the USPS confirmation that his office got it on July 25, 2013. If I don’t get a response from Fr. Pachón in a few weeks, I will bring the matter to the attention of Archbishop Salvatore Fisichella of the Pontifical Council for Promoting New Evangelization. I sent a registered letter to Archbishop Fisichella on November 19, 2012, about the Shroud of Turin and your criticism that my slideshow/lecture “debunked” the Holy Shroud (http://newevangelist.me/2012/10/02/the-truth-about-the-shroud-of-turin/). I have not even gotten an acknowledgment that this letter was received. I will ask the Pontifical Council to consider both matters. I’m complaining about the character of a number of Jesuits and Dominicans teaching in the United States for helping the American Journal of Physics cover up its mistake in publishing the enclosed article (Am. J. Phys., Vol. 76, No. 11, Nov. 2008). The article promotes atheism because it misrepresents evolutionary biology. The inability of science to explain the origin of the universe, the origin of life, the evolution of whales from single-celled organisms in a hundred million decades, and the “fine-tuning” of physical constants is a sign that the Bible was divinely inspired because the Bible says God created the universe from nothing and cares about our welfare. The article undermines the integrity of science and is a matter of national concern. I have filed a complaint against the AJP with my representative in the United States House of Representatives. If the AJP retracts the article, it will show how irrational atheists can be about biological evolution and religion. Jesuits and Dominicans are involved through their connection with Stephen Barr, Ph.D., who is a prominent physicist and a member of the Academy of Catholic Theology. Dr. Barr told me that I am mistaken about the AJP article and am “harming the Catholic Church.” I asked the Jesuit and Dominican members of the Academy of Catholic Theology to expel Dr. Barr or resign from this organization. One Jesuit, a theologian, told me that it would be “inappropriate” for him to question Barr about his knowledge of physics. My allegation against that particular Jesuit is that he is a coward. I had no success in getting the Jesuit provincials to meet with me. I filed a complaint with the Father General, and my registered letter was received on July 27, 2013. On August 25, 2013, I got an email from webmaster@sjcuria.org saying some office would contact me. No Jesuit did, but on September 9, 2013, I met with Rev. Brian Mulcahy, O. P., who is the chairman of the Providence College Corporation. A physics teacher and a biology teacher at Providence College have been giving me a runaround about the article. Fr. Mulcahy promised to confront these two teachers with my allegations. The biology teacher is a Dominican, and Fr. Mulcahy knows him personally. On September 13, 2013, I told the Jesuit webmaster about this meeting in an email. I am a Catholic currently residing in the parish of the Church of Notre Dame in New York, NY, 10026. I’m in a conflict with Cardinal Dolan over the Shroud of Turin and evolutionary biology, and am hoping you can help resolve these conflicts. Concerning evolutionary biology, Cardinal Dolan is only indirectly involved. My main antagonist is someone you have crossed swords with: Stephen M. Barr. In May of 2012, the newsletter of the Catholic Truth of Scotland published an article I wrote criticizing the American Journal of Physics for not retracting an unbelievably absurd article about evolutionary biology and thermodynamics (Am. J. Phys., Vol. 76, No. 11, November 2008) that Richard Dawkins was using to promote atheism. Dr. Barr in an angry email said I was wrong and was “harming the Catholic Church.” I’m accusing Dr. Barr and a number of Catholic priests at Catholic colleges of helping the American Journal of Physics cover up its mistake. The article is based on a fake calculation proving that evolution does not violate the second law of thermodynamics. Thermodynamics is the study of liquids, solids, and gases and has nothing to do with evolution. This article proves the scientific culture of the United States is against religion, and its retraction will be a victory for religion. I am writing to explain to you why you should meet with me to discuss the absurd article published by the American Journal of Physics about evolution. At this meeting, I will explain why and how Fr. Austriaco is helping the science establishment in the United States disseminate misinformation about our salvation history. You will have to tell Fr. Austriaco about this meeting, and this might encourage him to behave more responsibly. You showed poor judgment in implicating Br. Thomas Davenport in this scandal by making him your advisor. I met with Fr. Mulcahy on September 9 and explained to him why the AJP article was absurd, and why you two are being dishonest. He told me he would confront Fr. Austriaco with my criticisms. In the meantime, I got an email from Daniel Styer, the author of the absurd article. I called him at home, and we discussed the matter for sometime. He seemed to be stressed out by what I am doing and saying. His suffering, and all the other suffering I have caused, is not on my conscience. I am following my conscience. What you can do is contact your congressman and ask about the status of the investigation being conducted by Yvette Clarke (D-NY, 9th district) according to Scott, her director of communications. If there has been no investigation, I will file an ethics complaint against Congressman Clarke. Maybe I can get Scott fired, just like, I hope, I got David Grier fired. My offer to go to Providence and tell you two off to your faces is still open. You are becoming scary. Please do not come to my campus. I keep a 32 revolver in my desk to protect me from people like you. Please have no doubts about me using it on you. Please take me off your mailing list and never contact me again. 1) On Feb. 1, 2012, I told the AJP about the error in the article. 2) On June 28, 2013, I told Dr. Styer about the error. 3) On Sept. 9, 2013, I told Fr. Mulcahy about the error and said that you and Fr. Austriaco were helping the AJP cover up its mistake by lying to me. Fr. Mulcahy promised to confront Fr. Austriaco with my accusations in an email to Fr. Austriaco, who was abroad at that time. 4) On Dec. 20, 2013, a creationist emailed Dr. Styer about my efforts to get the AJP to retract the article..
5) On Dec. 21, 2013, Dr. Styer emailed me "CreationWikiReply.pdf." In a long and emotional telephone conversation he said my article in Creationwiki.org titled "Pseudoscience in the American Journal of Physics" was wrong. Styer's document and his statements on the telephone were irrational and incoherent. This raises the question of what transpired between Fr. Mulcahy, Fr. Austriaco, and you. Why do I get threatened with death after telling Fr. Mulcahy that you and Fr. Austriaco are Satan's rag babies? In a telephone conversation on August 4, 2015, Fr. Joseph LaMorte told me that you did not consult with your Presbyteral Council before suppressing my slideshow/lecture on the Shroud of Turin. I hope you don’t make the same mistake in connection with another blemish on the Catholic Church in the United States. The Magis Center is run by a Jesuit and has the support of two cardinals and three bishops. This group promotes irrational arguments for God’s existence using pseudoscience. I have asked for an opportunity to explain the harm the Magis Center is doing to the Presbyteral Council. I gave Fr. LaMorte the handout I am planning to use if my request is granted.